A current buzzword that we hear a lot about is “social media monitoring” that seems a very nebulous term and appears at first to be difficult to define, and somewhat tricky to determine its value to brands. 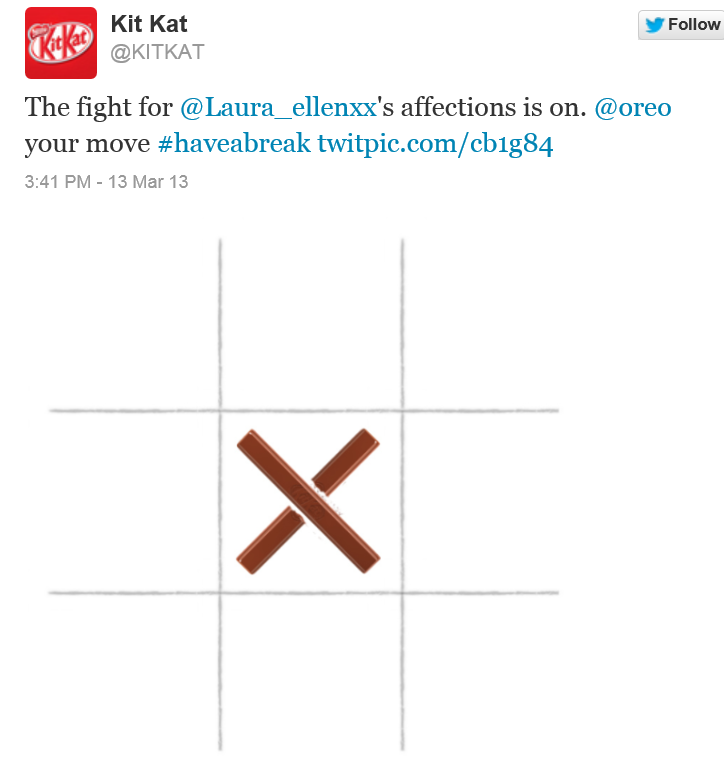 By using tools to monitor what was being said about their brand online, they noticed the tweet, they identified an opportunity to engage both a consumer talking about their brand(who appears at a quick glance to be a brand advocate) whilst simultaneously engaging another brand, Oreo. Notice how the tones of both of these tweets from both brands are almost lighthearted banter – the chosen tone is absolutely key to engaging consumers and brands, and both brands nailed it in my opinion. 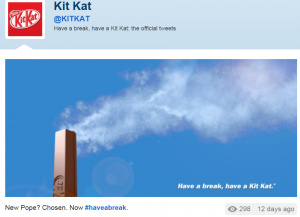 But KitKat often uses current events as the basis of some simple but entertaining and RELEVENT communications online, like this one when the new pope was elected. Listen daily to what people are saying about your brand online – not only can it be a customer service channel, it can be a product development channel, a brand evolution channel and certainly a consumer engagement channel. Don’t just put the youngest person in your marketing department in charge of social – it is potentially one of your most important channels to build (or destroy) your brand. Would you let an intern be your CEO?!! Have systems/procedures in place that allow you to reply very quickly. ‘Agility’ is the key word and most brands in 2013 are continuing with outdated, historic procedures and processes that do not reflect the capability for real time communications, listening, reacting to topical news stories, tweets and Facebook posts. 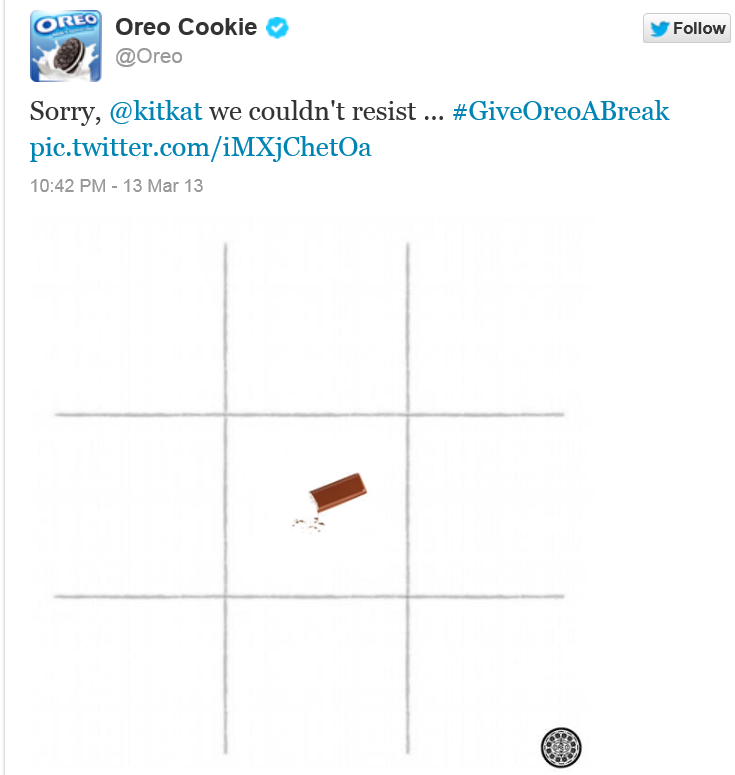 Kit Kat took 2 days to reply to the initial Tweet from the consumer, and Oreo replied within 7 hours to the KitKat tweet! 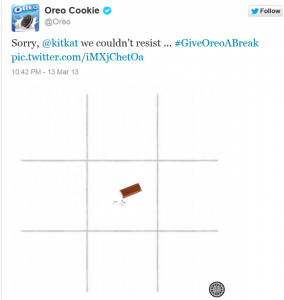 That means Oreo noticed the KitKat tweet, planned a strategy to counter it, came up with an idea, got client approval, executed it, and tweeted it within 7 hours! 99.9% of brands are not capable of doing that and they should be in 2013. Use current events for some of your brand content – it is relevent, entertaining and will be appreciated and noticed by consumers. Those brands that are agile, creative, forward thinking and recognize the multi directional, real time communications that are taking place without them online, will reap HUGE benefits for their brands if they put some social skin in the game! Yes, you are absolutely right. My point was that to produce significant content that needs client approval (rather than just a rapid textual reply that any good community manager can give), 7 hours is still pretty unattainable for most brands trying social. Really appreciate the feedback. Many thanks.